The United States: the country that moved east to west and got a bit less creative with state boundaries as we got closer to an even more creative idea of Manifest Destiny. What we as a nation are left with today is a national map that gives more visual weight to these larger, dare I say squarer, Western states than their Eastern counterparts. The Northeastern and Mid-Atlantic have a highly populated urban corridor from Boston to Washington D.C. which contain nearly 42 million people while the “Western” states have a combined 72 million people. Journalists at NPR provide a solution to better visually represent the dense populace that is the Northeast and Mid-Atlantic states while, for the first time ever, making Alaska and Hawaii the same size. Cartograms are a way to geographically represent data of any kind by replacing the area or distance with this new variable. The result would distort the real proportions of U.S. states according to this measure. 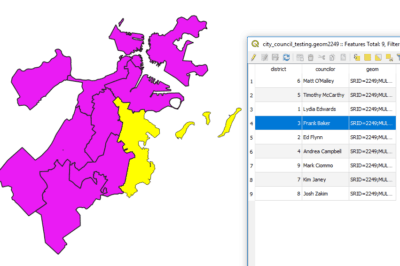 Similarly, a choropleth map uses shading to proportionally represent data. When these two methods are combined, one can create a map that shows two variables simultaneously. Adam Cole of NPR used this method to show state electoral votes against the amount of ad spending for political parties. 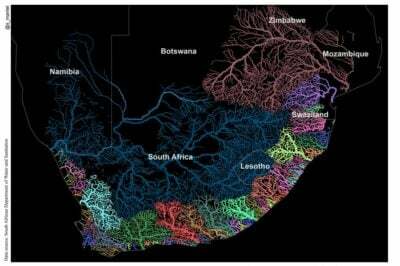 These types of maps are useful, depending on the story the data visualizer wants to tell. 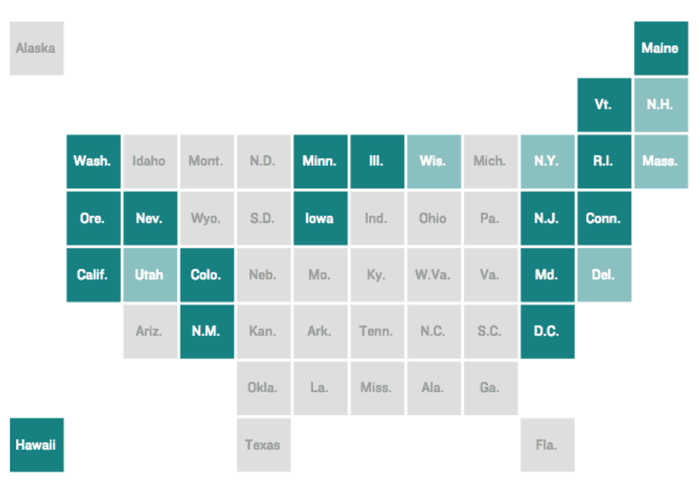 A new mapping method has emerged with high-profile news outlets like The New York Times and Bloomberg Business which are using tile grid maps, which represent each state with a congruent square. It allows for a quick scan of the information and prevents the reader from having to closely inspect the smaller states on the East Coast to decipher the data. Brian Boyer from NPR felt that this could be enhanced and found the square shape to be limiting. His proposal was to generate the same tile grid template, only this time using hexagons instead of squares as the unit. Square tile grid map. Map by Danny DeBelius and Alyson Hurt. Hexagons, Boyer argued, allow the data visualizer to maintain the integrity of the U.S. national borders and would make state placement easier. His final hexagon-tile map seems to alleviate his aesthetic concerns of the square map but remains imperfect to the very localized placement of states. In his map, North and South Carolina are side-by-side and Washington D.C. has a full coastline. 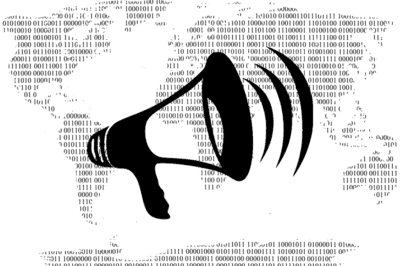 But in this present big data boom, these strategies are helpful for journalists to tell a clear and concise story visually. 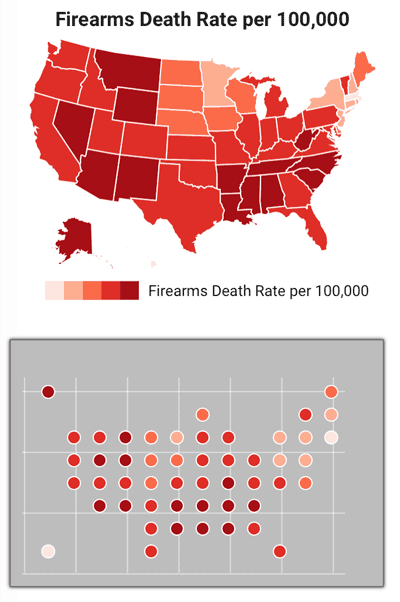 Firearm death rate per thousand mapped as a choropleth and a circle tile grid map. Map: Slemma blog.